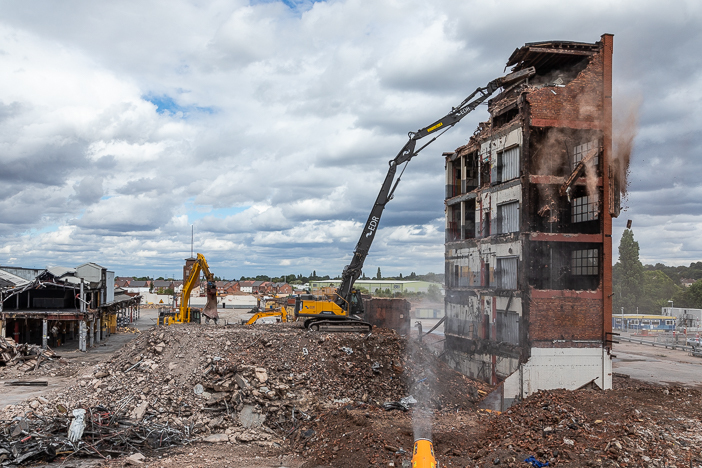 Last week I spent a day photographing the demolition of the old Goodyear tyre factory in Wolverhampton. 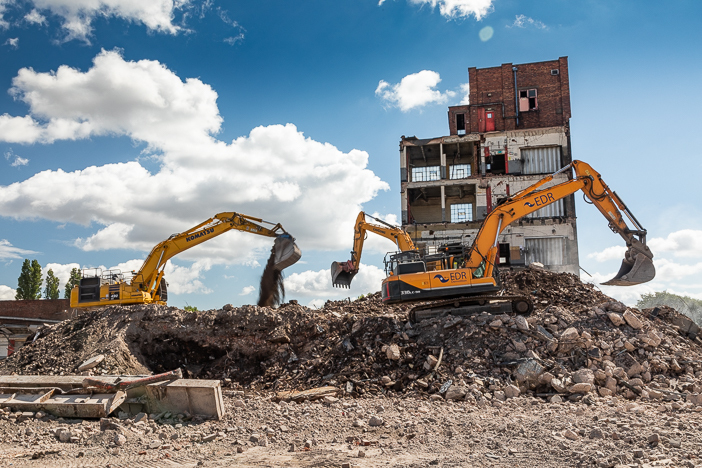 I was hired by Elford Demolition & Remediation (EDR) who have the job of raising the entire site to the ground. Obviously that takes longer than a day, but I was there to coincide with the demolition of a large 5 storey brick structure. The entire demolition is expected to last 8 weeks. 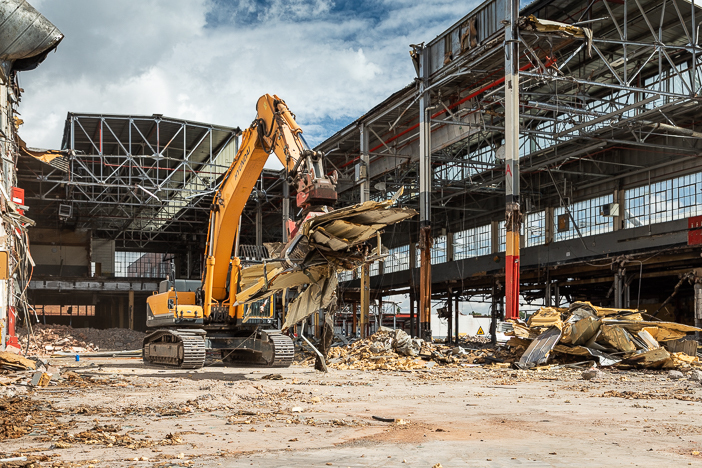 I am used to shooting in many industrial environments (see my other industrial photography here), but I have never been on a demolition site before. I arrived with my steel toecaps, hard hat, and high viz jacket, and unloaded all my gear, and signed in at the site office. I was given a safety briefing, explaining everything I would see during the day, and then accompanied on a tour of the site by the HSE Manager to decide what we would shoot. The morning started with great light, and plenty of blue sky, so I popped on a Polarizing filter to really emphasise the deep blue, and started shooting. The morning work consisted of 3 huge tracked excavators building a ‘pad’ for another high reach excavator to drive up in the afternoon and start demolishing the 5 story structure with its huge mechanical jaws. I had assumed demolition companies used massive steel wrecking balls, but those are far too primitive these days. My guide explained, modern demolition is so technical, to maximise the amount of recycling of materials from a site. The huge structure had already been worked on to weaken the steel girders, so it would be easier to pull down, and all material had been stripped from it’s interior. One thing that surprised me was the lengths EDR went to, to minimise the impact on the surrounding environment. There is a school, and residential housing around the edge of the site, and they did everything possible to keep noise, dust and pollution to a minimum. All around the perimeter of the site, are monitors on poles, that pick up the amount of dust and pollutants in the air. 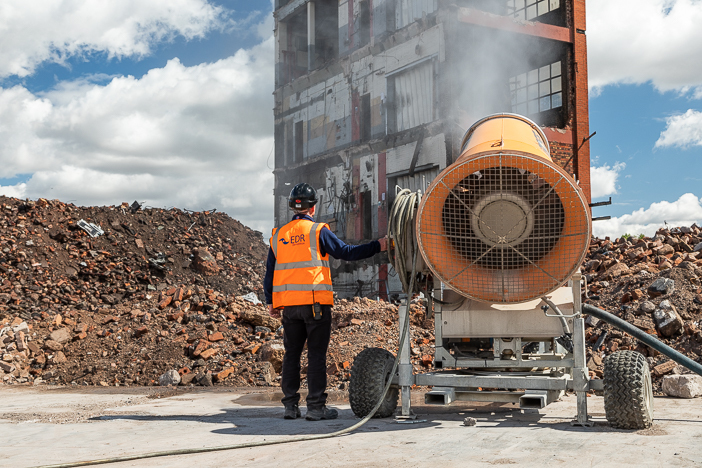 There are also huge water blowers that spray a fine mist of water over the work area to kill the rising dust. They also monitor the weather and wind direction closely, and how it impacts on the site. 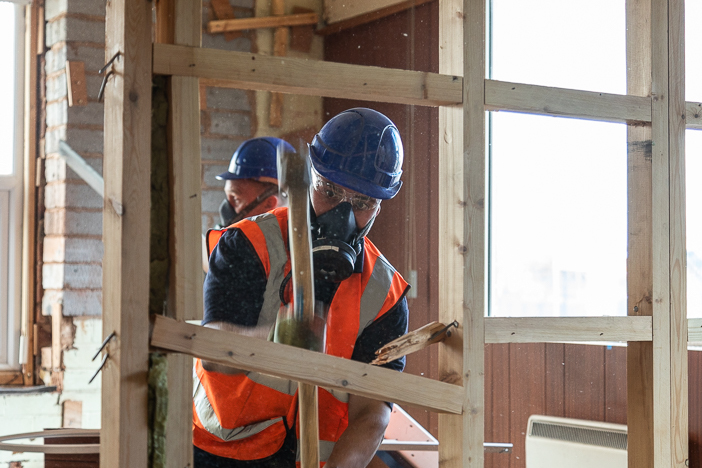 We also shot the more hands-on side of demolition, or soft stripping as it’s called, which is removing the interiors of structures first – usually with sledgehammers and crow bars! 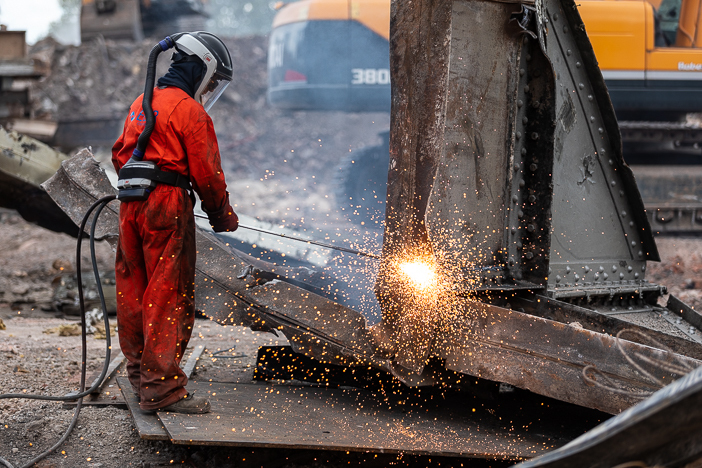 A very dangerous, but spectacular job is the steel cutters, who using oxy-acetylene torches to cut the huge steel structures that have been pulled to the ground, into bite-size chunks that can be loaded onto the back of a lorry, to go off for recycling. A great photo-op with plenty of sparks. Finally when all the preparations have been done, the huge high reach excavator is driven up the ‘pad’ and starts to pull down the building with its steel jaws. It was an interesting day, and the client is delighted with his images, which he will use on his website and a new brochure. If you would like me to photograph your business, please call me on 07866 230147.